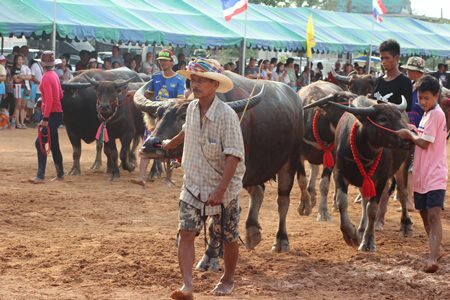 The sound of hooves thundered around Lake Mabprachan again as Nongprue hosted its 12th annual buffalo races. 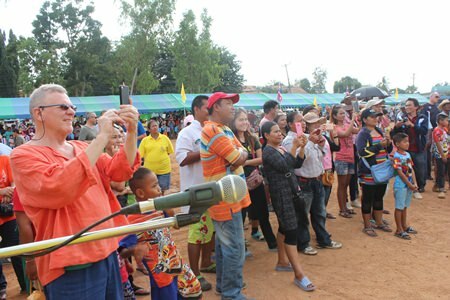 Banglamung District Chief Chakorn Kanchawattana opened the Dec. 13 festival with sub-district Deputy Mayor Anake Pattanangam. 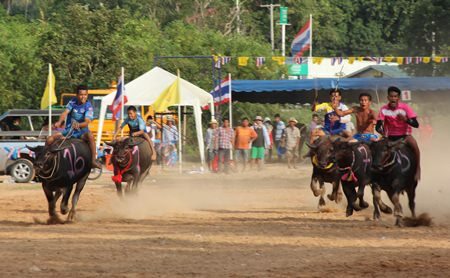 The day featured races in five categories, a cart parade, a Nong Nang Baan Na pageant, boar-chasing, and races between man and beast. 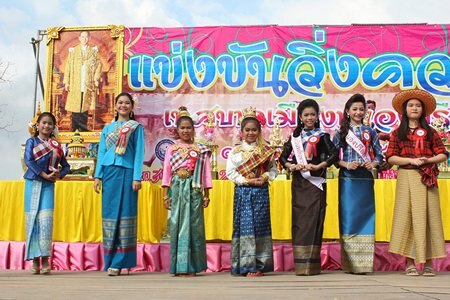 Fahpratan Pol-A-Han won the beauty pageant, taking home 4,000 baht. 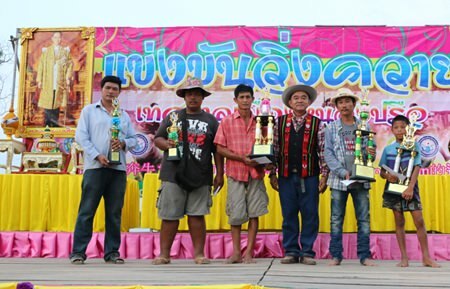 Natthiapicha Chalothornpised won 3,000 baht for second place and Piyanat Pichitbawornniwed 2,000 baht for third. 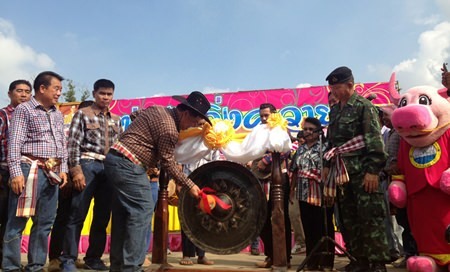 Officials bang the gong to officially open the proceedings. 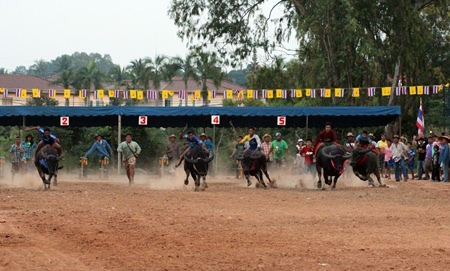 Nongprue hosts one of several buffalo races held in Chonburi, a province with a long history in the sport. 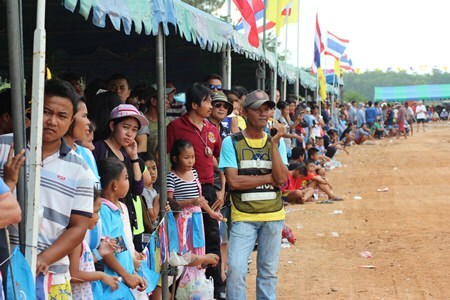 Nestled among the busy city of Pattaya, Nongprue organizes the races and festival in attempt to preserve historic tradition, as well as boost tourism. 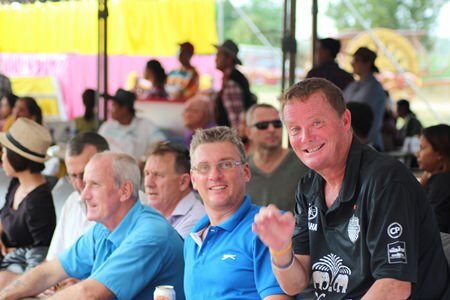 The event also featured a large number of small vendors selling food, beverages, toys and locally made products. 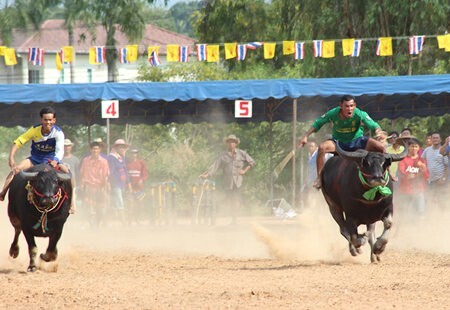 The races featured buffalos in five classes: super junior, special junior, small junior, large junior, and large. 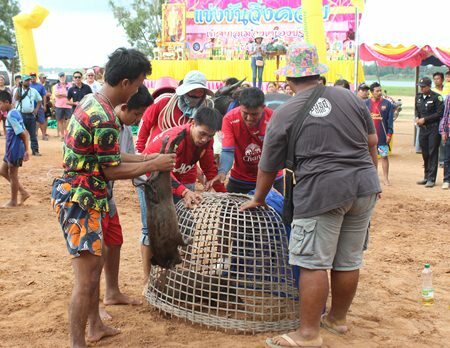 The big boys come rumbling down the track. 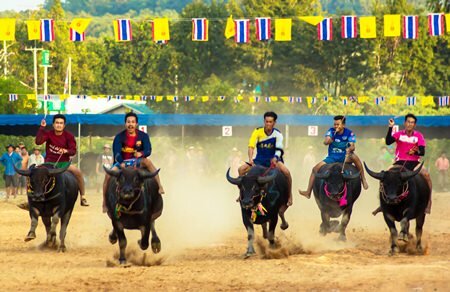 Somboon Marb Pai won 6,000 baht for taking first in the marquee large-size race, with Jack Nong Kang Kok taking second and Kamnan Suwith third. 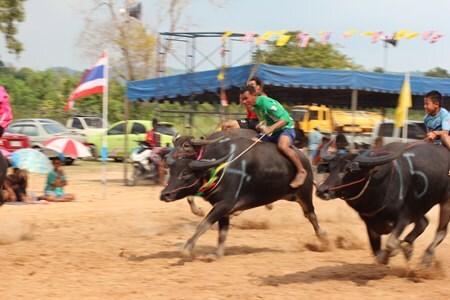 In the small junior race, Kamnan Suwith won the 6,000-baht first-place trophy with Jay Thor Yai and Koh Bang Pra placing second and third, respectively. 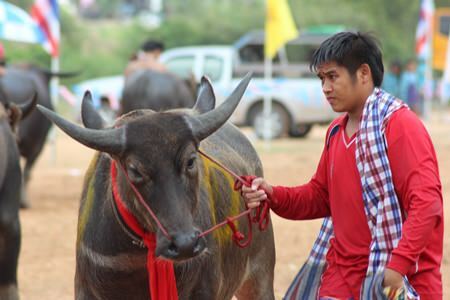 It’s not always possible to control these huge beasts of burden. 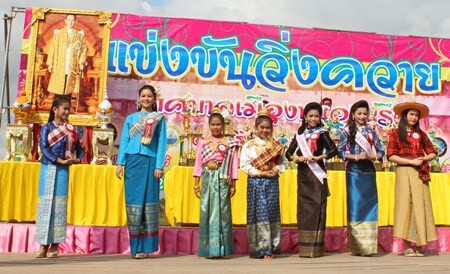 In the big junior category, first place went to Dang Baan Huay Kamnan while second was won by Na Yok Somsak and third by Pae Hua Kunja. 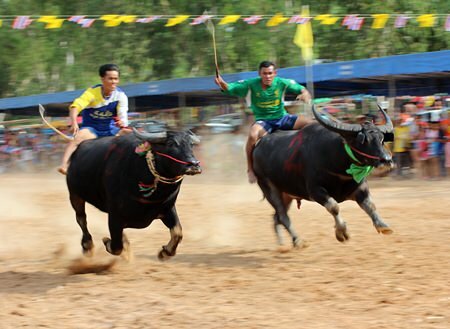 The super junior’s top three finishers were, respectively, Dang Baan Huay, Tem Klong Kiew, and Wiroj Sanak Bok. 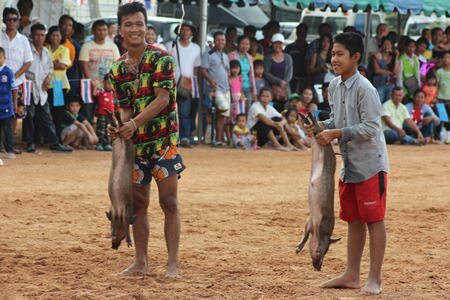 And the special junior category’s winners were, in order, Aoh Baan Beung, Tum Napha and Jack Nong Kang Kok. 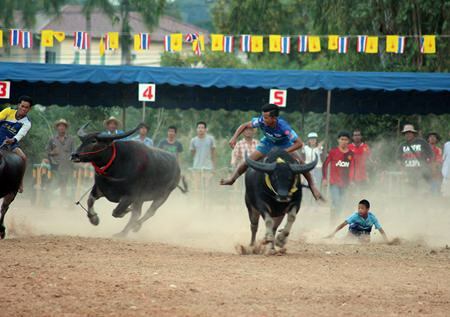 Neck and neck towards the finish line. 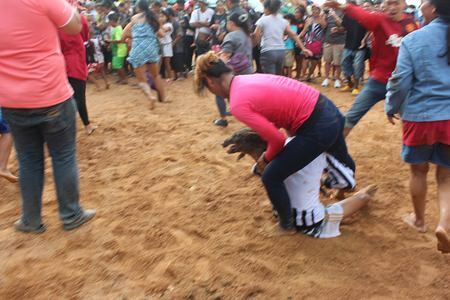 She did it! 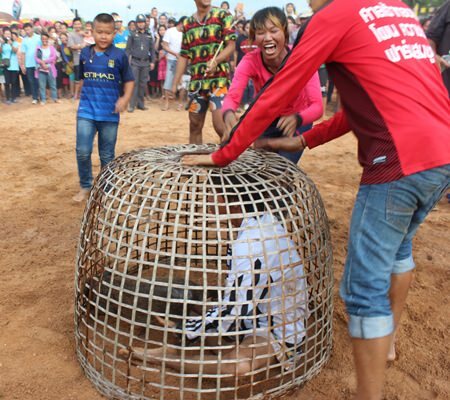 She captured a pig during the wild boar contest. 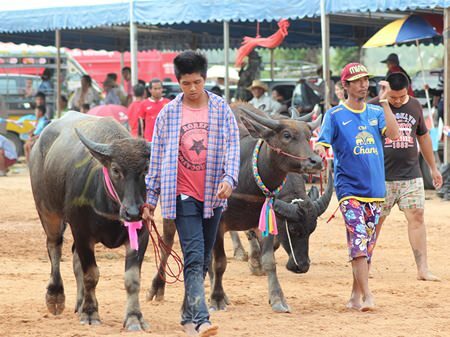 Young hopefuls line up hoping to win this year’s Miss Buffalo crown. 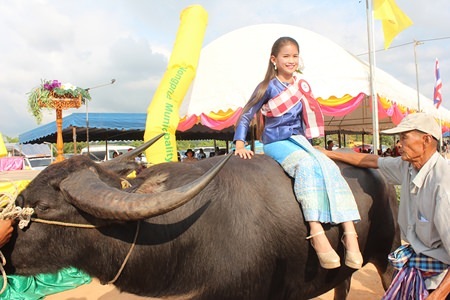 If you’re going to compete for the Miss Buffalo crown, you have to be able to look elegant atop a water buffalo.